Is Your Agency Focusing Too Hard On Clients And Trivializing Your Own Initiatives? 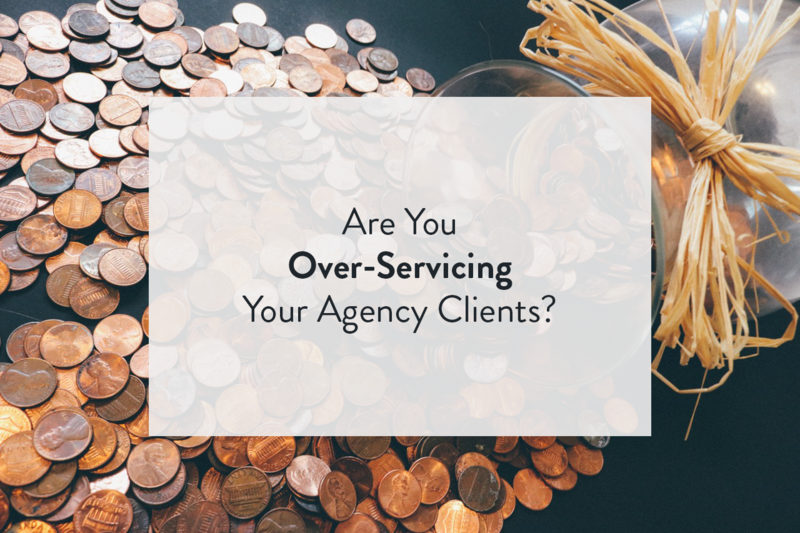 Is Your Agency Focusing Too Hard On Your Clients And Trivializing Your Own Initiatives? Commitment is good. You need to prove to clients, new and old, that you’re able and willing to take on as much as they can throw at you, and that the old adage is true: the customer is always right. Your customers have got to stay happy so you can keep paying the bills. But at what cost are you keeping your clients happy? Sometimes, agencies fall into the trap known as over-servicing—doing too much to keep clients happy. Yes, it might sound like a humblebrag, but it can get serious. Over-servicing clients could mean you’re giving away services for free that you should be charging for, which hurts your growth; or you’re staunching the development of your own brand, which hurts your growth; or you’re spending more hours and manpower than necessary to keep clients happy—which, yes, also hurts your growth. Basically, what we’re saying is your growth potential might be suffering, and we want to help. Successful small and mid-sized agencies eventually hit a point where they have to evaluate how they’ve reached where they are, and where they’re going next. If you’re in this position, you need to ask yourself some hard questions. Is your agency giving away something you could be charging for? Sometimes simple bonus services, like community engagement and pushing customer marketing, can get away from you down the road. Returning clients may start to expect great work done for free—or at least included in a low-cost package—simply because you started off throwing them in as value-added bonuses. It’s an incredibly difficult thing to ask a client to start paying for something they’ve been getting for free. But the fact is, offering these small bonuses actually devalues your work and brand identity. If what began as a modest Instagram campaign has sprouted into thousands of followers you’re now managing, the client may not realize the kind of workload involved in maintaining those numbers, and could be taking you for granted. The best way to approach the subject is to start a frank dialogue about your own agency’s investment, the ROI for the client and how much you think it’s worth. You can assign a number value to these kinds of services and add them as bonus subscriptions for the client, and let them decide whether they want to start paying for it or not. If you can sell their brand, you can sell them on the idea that what you’re doing has value. Are you taking on more new clients than you can keep up with? It’s okay to say “no” to new clients. In fact, this can be a good thing—it tells these potential clients that you’re doing something right and you’re in high demand. Small agencies tend to get in a mindset that they want to reach out and create as many new opportunities for themselves as possible. But when you do that, you’re limiting the attention you can pay to each existing client, which may damage your relationship with them down the road. You want to keep the influx of new business at a manageable level that works for your agency. This may also mean communicating to clients that you’re busy right now. To be honest, they might even appreciate the candor, because it means you’re not lying about workloads or delivering content past a deadline on a flimsy excuse. It’s not ideal, but if the answer is to bring on outside help to get workloads finished… well, read the next question. Can your agency handle your current workload? Maybe you’ve already hit the point where you’ve stopped accepting new clients and need to focus on the ones you have. But the workload you’re now faced with might be enormous. How do you get around it? If it’s not a good time to hire, consider outsourcing small jobs to freelancers you know and trust. Obviously the midst of a big project isn’t an ideal time to gamble on new talent, but it could be a great opportunity to grow a relationship to keep in mind down the road. Are your agency’s employees happy? The bottom line might be even more clear than evaluating new work against existing work. At the end of the day, if your employees aren’t happy, your business will suffer. Corners will be cut. Clients will notice. Focusing too heavily on client satisfaction can mean forgetting the core troops who got you to where you are. There are numerous ways to boost employee morale—adorable animals and snack food are two of our favourites—but the best course of action is to touch base, meet with people one-on-one, and think about where you can go from here. If you’re growing your business quickly, that’s fantastic. But don’t let that growth get ahead of you.